Deputy Defense Minister Danny Danon promises 'firm and painful' response to Hezbollah attack in wake of senior leader's assassination. Israeli Deputy Defense Minister Danny Danon has warned Hezbollah against attacking Israel, after the group blamed the Jewish state for assassinating one of its most senior leaders. "If Hezbollah attacks Israeli territory our response will be firm and painful," Danon was quoted by army radio as saying following the accusations. Early on Wednesday, Hezbollah announced that Hassan Hawlo al-Lakiss had been assassinated during the night at his house in the Hadath region, east of Beirut, and was quick to accuse Israel of carrying it out. "Direct accusation is aimed of course against the Israeli enemy which had tried to eliminate our martyred brother again and again and in several places but had failed, until yesterday evening," the Iranian-backed Shia Islamist group said in a statement. The Syrian government - which has supported Hezbollah since its inception - echoed those accusations, adding that it condemned the "terrorist, cowardly" assassination. Israeli officials meanwhile have dismissed the allegations. Foreign ministry spokesman Yigal Palmor told AFP that "Israel has nothing to do with this." "This is yet another Pavlovian response from Hezbollah, which makes automatic accusations (against Israel) before even thinking about what's actually happened," he added. Israel's Energy Minister Silvan Shalom reiterated Palmor's denial on public radio. "Israel has nothing to do with this," he said. "Even if we're happy about it, it's the Salafists who have carried it out," Shalom continued, referring to extremist Sunni Muslim groups that oppose the Shia, Iran-backed Hezbollah. "It's a harsh blow for Hezbollah, which has tried to present the assassination (as Israeli) in order to distract from internal wrangling and divisions in Lebanon brought on by the Syrian" civil war, Shalom stated. Despite Hezbollah's claims that Israel was responsible, two previously unknown Sunni Muslim groups issued separate claims of responsibility. The Free Sunnis Brigade of Baalbek called the killing revenge for "abuses" of Sunnis in Baalbek, a Hezbollah bastion in eastern Lebanon and Lakiss's native city. Meanwhile, Ansar al-Umma al-Islamiya said it assassinated Lakiss because he was "Hezbollah's field commander and directly responsible for the massacre in Qusair", a strategically-important Syrian rebel town that fell to regime forces in June with Hezbollah's help. Hezbollah television said Lakiss was shot repeatedly with a silenced handgun after parking at the building where he lived, adding that there was more than one assailant. A Hezbollah source called Lakiss a "personal friend and one of the closest people to (Hezbollah chief) Hassan Nasrallah, both on the personal and party levels". Fare's precise role in the Lebanese terrorist group is unknown, but the source added that "part of his work was to ensure the organisation of Nasrallah's security." Ali Fares, who lived in Lakiss's building, said his son saw from his window two men fleeing. "I went downstairs with the other neighbors and I saw the body. It appears they attacked him when he was getting out of his car," Fares said. Later on Wednesday thousands of people braved heavy rain to attend Lakiss's funeral in Baalbek. 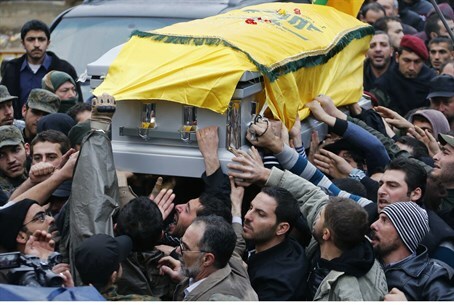 His coffin was carried through the crowds, draped in the Shia movement's yellow and green flag. Lakiss was the most senior Hezbollah figure to be assassinated since Imad Mughniyeh was killed in a Damascus bombing in 2008, which the group also blamed on Israel. Both men were part of Hezbollah's secretive top leadership. Like Mughniyeh, Lakiss operated behind the scenes. His killing comes seven months after Hezbollah first openly admitted fighting in Syria alongside President Bashar al-Assad's forces. More recently, two suicide bombers killed 25 people in an attack on Iran's Beirut embassy. Nasrallah again defended Hezbollah involvement in Syria on Tuesday in an interview with Lebanese broadcaster OTV, saying it was fighting to protect Lebanon from the Syrian rebels, who include jihadists linked to Al Qaeda. "Should Syria fall into the hands of these armed groups, what will Lebanon's future be?" Nasrallah asked. "We went to Syria to defend all of Lebanon." Nasrallah also accused Saudi Arabia of being behind the bombing of the Iranian embassy. In that case as well, Hezbollah initially blamed Israel. While Hezbollah and its regional backer Iran support Assad, Saudi Arabia backs the Sunni-led rebels seeking his ouster.